I dug these two shows out recently as I hadn't heard them in a while. At the time they were great, looking back now...the perspective element that frequently appears here...they seem even better. I'm going to look at both performances from Elton and Ryan in 2002 and then make a case for a new direction for beyond 2014. 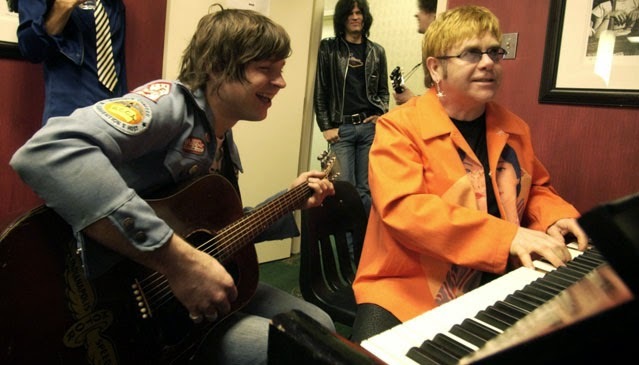 We all know Elton has done some great hookups over the years, this one with Ryan Adams being of the highest order. There's no Lady Gaga vacuous rubbish here. Ryan Adams is an artist of the highest quality. Elton fan's have a lot to thank him for. Without the Heartbreaker album, the tremendous third age of Elton's recording career from SFTWC onwards wouldn't have happened. The inspiration it generated in Elton's aspirations to make better albums are clear to hear. If you listen to Heartbreaker the influence is incredible. I'll mention a few of them as I progress. But let's be clear, strong songwriting is the key. I mentioned that on the last post about CATK. Give the actor the great lines and it's ovations of the standing variety all round. Give him the cliche's and he's setting up a fruit stall of the rotten kind. Once Elton had got that part sorted out he was then able move on with the next plan. Recording it in an organic form that wasn't drained of any nutrients. Especially the harder ones. The concept of CMT Crossroads is to bring the best of country and the best of rock together for a musical summit that confirms the strong links between both houses. Country and rock but not country rock. The meeting of Ryan and Elton promised much and delivered...but not at the first attempt. For the first performance in New York it's all Elton. Ryan took ill on the day and couldn't perform. A rearranged date two weeks later in Nashville was setup. But the show sans Ryan went on. As is always the case with Elton in adversity, the night is saved. So rather than sending the patrons home he put on masterclass to a mostly unfamiliar audience. For the first segment he did a showcase of hits both contemporary and new and the classic album tracks solo. The opening Your Song was impeccable, his voice was razor sharp clean. When you hear so many versions from today and then hear it from back then it's quite a contrast. Original Sin is incredibly cosy, it's slightly adjusted pace giving an extra depth. I Want Love, one of the all time classic Elton singles, still sounded powerful devoid of it's familiar motifs. SFTWC was out over six month's by this stage but Elton was still feeling the love for it. As were the audience. So far it was a spellbinding set of songwriting masterclass. Part of the deal was that both artists would perform each others songs. One of Elton's choices was Oh My Sweet Carolina, a deliberate choice as we'll see later, and he performed it with Ryan's terrific band. Complete with pedal steel inflections, the proper sound of American music, it's old style balladry bookbound with a classic melody. Luckily for us Elton took the song on the road for the next year or so as part of the solo section of the band tour. He'll Have To Go is played out with out any stereotypical mawkishness that sometimes appear when others take the song on board. The music flows with a shimmering solo. Rocket Man is another highlight, it's tight and determined. Plenty of Martian dust thrown up. By the end of the hour, the hour of Elton had arrived for those in the audience not tuned in. But they were spaced out I believe. Skip forward two weeks to the Grand Ole Opry, Nashville and Ryan has passed his fitness test. Both artists play off each other like two spinning dice. The second performance is a more windswept affair. It has an unpredictable swagger throughout and though not off the cuff it gives that impression. A quickly dished out cover like Lovesick Blues emphasising that point. Elton favourites like Daniel and Tiny Dancer are spiced up with Ryan's input but don't overtly sting the pallet but leave a nice after taste. My Sweet Carolina is again played, this time in keeping with the album version but roles reversed. On disc Emmy Lou Harris harmonises with Ryan on the chorus, a device and technique that Elton in turn employed to great effect on SFTWC with Rufus Wainwright doing a similar turn on American Triangle. This time however Ryan takes the Emmy Lou position and let's Elton take centre stage. Sensational performance here, this is incredible. Answering Bell with an amazing high note from Elton at that the time has a terrific solo from him. Firecracker is a melodic uptempo number with yet more vocal muscle from Elton, clear succinct lines all the way through. Rocket Man appears again as the finale, more rockier again than the first outing. Ryan's short vocal jabs backed up with equally punchy guitar licks from him. A thunderous end to a successful summit. So what did we learn. 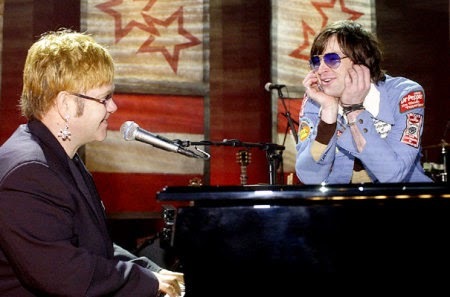 On the night and soon after we saw the affection Elton had for Ryan. Talk of songwriting together unfortunately never materialised. Nor did any other engagement much between the two. No doubting though the influence lasted long after, ultimately Peachtree Road in particular and CATK channeled Elton's American taste into his own style with stunning albums in both cases. I say American and I stress that. I stress it to differentiate between it and 'Americana'. Similar sounding when you say them, totally alien to each other on disc. Like Martians...and Uranus's (or whatever people from that planet are called). Ryan is preparing to release another album right at this minute. He's been pretty busy in the intervening time, this album he's producing himself. He's already produced other artists during that time so is no stranger to the job. I was reading recently on some Elton forum's about when, or if, or even dare I say it why, Elton should record again. Let's be positive and say he will. Who should produce and what should it sound like? Assuming Elton wants to keep the American theme going, or at least take the critical elements from it, then one thing should happen. The current producer has no business foisting his own brand of watered down 'Americana' style in my opinion. It's a toned down, too safe of a sound. He walks around in a black and white persona in a colourful music world. More Nicholas Parsons than Gram Parsons. Devoid of grit and gristle. Ryan Adams has that in steel buckets. He has a connection with younger fans, the hip set without the hopping around. That vibrancy of colour to channel Elton's live persona (which is lacking so much on the last album I put electric pads on it once to revive it. It's still flat lining) into the studio that it makes you feel he's sweating in front of the mike when the red light is on. The edginess I keep going on about, SFTWC up until CATK is dripping like a torrent with it. That's what helps them work on so many levels. A bit of acceleration thrown in and we've got a winner. Ryan has the hard edge that tempered with Elton's more honed style shall we say would be a killer combo. Somebody like Ryan Adams gets airplay. Not so much on pop stations, but on the more musically aware stations. Over here there's a station I sometimes tune in to, TXFM (formally Phantom FM). That's where I first heard his new song, Gimme Something Good. It has a caustic sound. An Eagle's influence is evident, plenty of harmonies with some stunning organ. A properly recorded sound that lets the substance dominate and the style find it's own place. Strong songwriting wins every time. 'But these radio stations won't play Elton though, will they? He's old hat!' I hear the critics chime in. But hold on trolls, get this one in under your furry heads. A few songs later they played the new song from Leonard Cohen, he who is 80 years of age of course. Produced by Patrick Leonard if you please. A small world and shrinking. The point I'm making is with a younger, yet experienced producer who knows his Elton onions, one last stab at getting a proper finale to the recording career can be achieved. This time last year we were waiting for the new album to be released. If you listen closely you can still hear the sudden intake of breath when it dropped. Some stopped breathing permanently I believe, electric pads no use again. I was asked by some folks to do something here evaluating it twelve month's on. I've absolutely no wish to go back to it, it's in the past thankfully. I'm looking forward to the future and the great hope that one day we'll hear a proper Elton album again. With strong, adventurous songwriting. And with the band of course, that's a deal breaker as far as I'm concerned. If the band aren't on any future recordings then Elton will further alienate certain sections of the fanbase by parking them yet again. If that concept escaped some people grasps twelve month's ago, the message has been delivered. You can't go round praising the band on one hand then not caring whether they play on the albums or not. They're musicians, not photo opportunities. It's either all in or not at all in my book. A promise can to deliver. If Elton wants to stand like justice herself and balance the scales of commercial and critical success, then this route, if carefully navigated, will deliver a unanimous verdict.